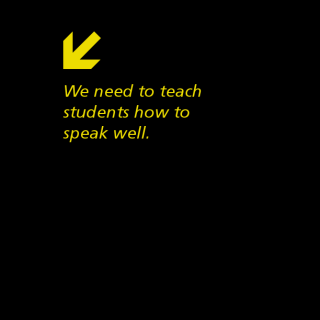 It had never occurred to me that I haven’t taught my students how to speak well. After all, for the past 7+ years my students have spoken in front of their peers. I have told them to stand up straight, to speak clear and loud and to establish eye contact. That should be enough, right? Except for the last 7+ years I have also sat through one terrible presentation after another. Yes, most have spoken loudly, yes, most have had some stilted eye contact, and yes, most have stood up fairly straight. Yet, most have also been terrible presenters. No passion, no enthusiasm, no special something that have made them enjoyable to listen to. I figured it was because I taught elementary school and perhaps better speaking skills would develop naturally. As a 7th grade teacher, now I can see that they don’t. My 7th graders still present fairly poorly and I realized, with the help of Erik Palmer, that we need to teach how to speak well. Not just assume that students will figure it out over the years. We need to teach it early, we need to teach it often, and we need to teach it every year. So I have snagged ideas from Erik’s article and adapted them to fit our purpose. Feel free to use and make your own and check out his other resources as well, it has been easy and fun to use.